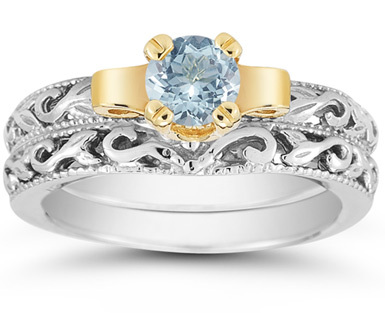 This genuine aquamarine engagement bridal wedding ring set revels in the Art Deco period design of the 1920s. A Swirling flower and petal motif is delicately etched into the smooth 14k white gold band. A lustrous yellow gold lotus flower opens to offer one solitaire, precious, round, 6mm round 1 carat aquamarine. Includes matching Art Deco wedding band. Also available in 18k gold or platinum by request. 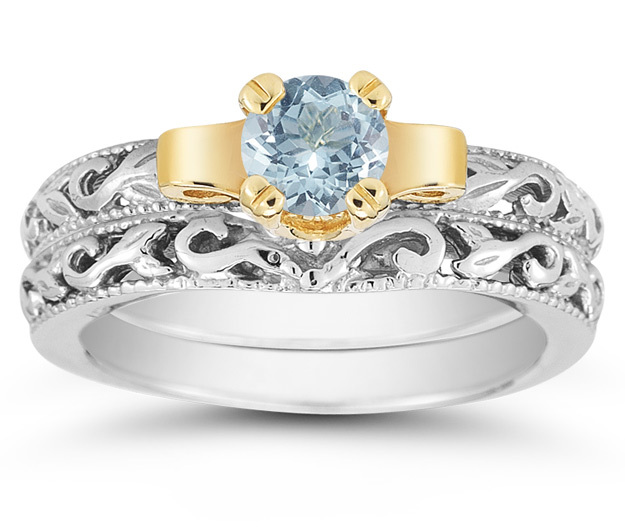 We guarantee our 1 Carat Art Deco Aquamarine Bridal Ring Set to be high quality, authentic jewelry, as described above.